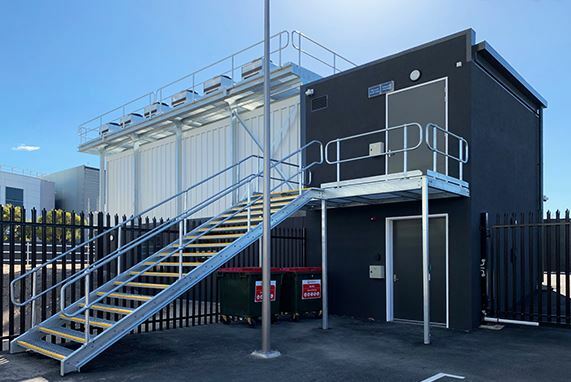 Prefabricated data centre specialist Flexenclosure has delivered its flagship eCentre data centre solution to NEXTDC Ltd, Australia’s leading independent data centre as-a-service provider. The eCentre has been deployed in East Perth, Western Australia and is now fully operational. Known as the “P2 microsite”, it forms a part of the new 20MW P2 Perth data centre project that NEXTDC is building over the next 18 months. Acting as a standalone facility for interconnection and telecommunications, the P2 microsite will provide Western Australia-based businesses with immediate connectivity to critical cloud services, metro, national and international links, in advance of the the completion of NEXTDC’s hyperscale P2 facility in 2020. At that point the microsite will be seamlessly absorbed, becoming an integral part of P2’s interconnect infrastructure. Designed and built to Uptime Institute’s Tier III standards, the P2 microsite will champion NEXTDC’s world-class infrastructure standards. TheeCentre facility was constructed and fully tested at Flexenclosure’s manufacturing plant in Sweden, before beingshipped to Western Australia for installation, comprehensive testing and final commissioning. The result is a world class micro data centre that has provided NEXTDC with the critical infrastructure required to deliver next generation services to its customers today and a seamless transition to the new P2 data centre in 2020. For additional information on this project, please see the Flexenclosure and NEXTDC case study. Already a major global player with data centre deployments across five continents, thislatest project further increases Flexenclosure’s momentum in the Asia Pacific region, following recent eCentre wins in Australia, the Philippines, Palau, Samoa, Fiji, Vanuatu and the Solomon Islands. Flexenclosure designs and delivers award-winning, prefabricated modular data centres for colocation, cloud and communications companies. eCentres are custom-designed, fast to deploy and energy efficient data centres and can be deployed as hyperscale, regional core, edge or micro edge facilities. Flexenclosure is headquartered in Sweden and has additional offices around the globe. With deployments across six continents, eCentre customers include Airtel, CenturyLink, Globe Telecom, Millicom, MTN, NEXTDC and Vodacom. Find out more at Flexenclosure.com, LinkedIn, Facebook and Twitter.